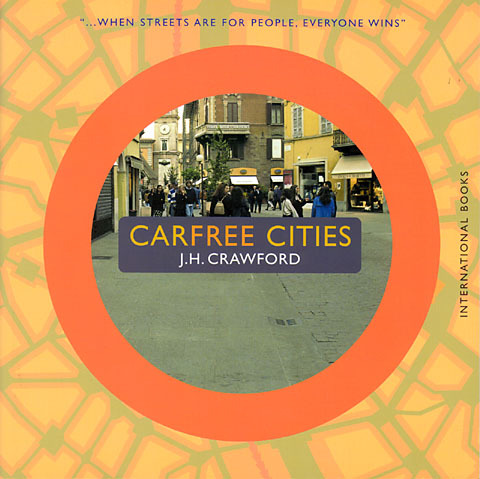 The paperback edition of Carfree Cities is now on sale. This edition differs from the hardcover first edition only by a handful of minor corrections and updates. The paper is thinner but of the same type, and the illustrations are reproduced nearly as well as in the hardcover edition. The binding is once again sewn, even though it's a paperback, so the book still opens easily. The paperback edition costs US$17.95 in the USA and £13.95 in the UK. Visit the How to Order page for more information. The hardcover edition continues to be available. Towards Car-Free Cities III will bring together 75 people from across Europe and beyond who are promoting alternatives to car dependence and car culture. The conference will focus on collaboration and exchange, assisting the practical work of conference participants - whether it be organizing carfree days or building the carfree cities of the future. The program will balance presentations with round-table discussions and other participatory activities. Your editor has been invited and plans to participate; he attended the first conference, in Lyon, which was highly productive. Other confirmed presenters include John Whitelegg (World Transport Policy & Practice, UK) and Lars Gemzoe (co-author and colleague of Jan Gehl). The organizers would appreciate recommendations for female presenters. Please see the web site for more details and registration. Traffic collisions kill more than one million people a year, with tens of millions more seriously injured. The cost to developing countries is double the amount they receive in international aid. Dr. Adnan Hyder, interim secretary of the Road Traffic Injury Research Network, said, "This is a neglected health problem. The global cost of road accidents in developing and emerging nations is at least $100 billion a year." The problem, he added, is particularly severe in sub-Saharan Africa and South Asia. "Global Traffic Deaths Put at Million a Year"
The recent sniper attacks in the metropolitan Washington area received enormous media coverage (doubtless encouraging others to attempt similar deeds). The attacks lasted three weeks and cost ten people their lives. In the USA, about 42,000 people die in road collisions each year, out of a population of 280 million. The population of the metropolitan Washington area in which the sniper was active is about 5 million, which means that we can expect about 750 road deaths a year in the region, or some 14 per week. Thus, in the period the sniper was killing, the expected road deaths would have been about 42 people, four times as many as died at the sniper's hands. This raises the question of why the much larger risk from death on the roads received so much less attention than the sniper killings. We simply refuse to acknowledge the scope of road deaths, or to do anything serious about it. Highway fatalities in the USA have remained above 40,000 almost every year for the past 50 years. Is it not time to take this problem at least as seriously as the sniper? According to the WHO, outdoor air pollution kills 3 million people annually. The Lancet published a study in 2000 which concluded that air pollution in France, Austria, and Switzerland causes more than 40,000 deaths annually in those three countries alone. About half of the deaths can be traced to vehicular emissions. In the USA, traffic fatalities run somewhat over 40,000 annually, but air pollution kills 70,000. Governments have paid comparatively little attention to deaths caused by vehicular emissions. In the Province of Ontario, population 12 million, air pollution costs at least $1 billion annually in hospital admissions, emergency room visits, and absenteeism. China's terrible urban air pollution costs about 5% of that country's GDP. "Air Pollution Fatalities Now Exceed Traffic Fatalities by 3 To 1"
What this all means is that cars and trucks are killing more than twice as many people as indicated by the usually-cited figures for traffic deaths. Americans on average face a 1-in-2,100 chance of developing cancer as a result of breathing polluted outdoor air, a risk nearly 500 times greater than the standard established in the Clean Air Act, according to an analysis of EPA air toxics data performed by US PIRG. Of the added risk, 89% arises from soot emitted by diesel-powered trucks, buses, and equipment. US PIRG analyzed EPA data from 1996, the most recent available, and calculated potential cancer risks associated with exposure to the 33 air toxics that pose the greatest urban public health risk. Cars, trucks, and non-road engines emit more than 500,000 tons of highly toxic diesel soot into the atmosphere, 65% from non-road diesels. Virtually all Americans are exposed to diesel soot at levels far exceeding the one-in-one million standard established by the Clean Air Act. Cars, trucks, and non-road engines release more than 250,000 tons of benzene into the environment, some 78% of total benzene emissions. Benzene causes leukemia and is associated with anemia and damage to the immune system. Cars, trucks, and non-road engines release more than 165,000 tons of formaldehyde, or 56% of the total. Formaldehyde may cause lung, nose, and throat cancers. PIRG applauded the EPA's commitment to implement tougher standards for diesel trucks and buses. Standards adopted last year call for a 90% reduction in diesel vehicular emissions. The EPA estimates that this will prevent 360,000 asthma attacks and 8,300 premature deaths annually. The EPA is also developing tougher standards for diesel construction and farm equipment. Nearly 500 Times Greater Than Clean Air Act Standard"
The high toxicity of diesel soot is a recent discovery. Soot must be dramatically reduced, and the problem is even worse elsewhere. Europe has far more diesel-fueled cars than the USA, and the EU must take immediate, strong action to quickly end this threat to public health. A two-week-old baby in metropolitan Los Angeles has already been exposed to more air pollution than US government standards for cancer risk exposure permit over the course of a lifetime. The "Toxic Beginnings" study concluded that an infant in Los Angeles would reach the EPA's one-chance-in-one-million limit of contracting cancer from air pollutants in the first 12 days of life. In California, the smoggiest state in the USA, the cancer risk to adults is hundreds of times higher than permitted by EPA standards. Children are even more vulnerable to air pollution than adults because they breathe more air per unit body mass. Diesel exhaust leads the list of toxic air pollutants. The National Environmental Trust urged lawmakers to make clean air a top priority. "L.A. babies get lifetime's toxic air in 2 weeks, says study"
This situation doubtless explains Bush's latest atrocity. . .
Bush & Co. predictably took the position urged by car manufacturers and opposed California's requirement that some passenger vehicles sold in the state achieve zero emissions, which, in practice, means electric cars. The Bush Justice Department maintains that federal law take precedence over state law, threatening implementation of California's zero-emission vehicle requirement, which would have required at least 10% of passenger cars and light trucks sold in the state after 2003 to emit no pollution. This case is not related to a separate issue in which a California law mandates limits on vehicular emissions of CO2 and other greenhouse gases. Automakers have threatened suit against this law, claiming that the only way they can reduce CO2 emissions is to sell cars that use less fuel. "Bush administration is against California's zero emissions requirement for cars"
"White House Joins Fight Against Electric Cars"
The latter claim may well be true, but Japanese manufacturers have for several years been selling cars that emit much less CO2. Detroit missed the boat and has turned to Bush & Co. for help. Bush's chief of staff, Andrew H. Card Jr., was GM's chief lobbyist, yet another example of industry's cost-effective purchase of political influence. Bush & Co. issued an executive order speeding federal review of transport projects nationwide. The executive order directs the DOT to list "high priority transportation infrastructure projects." Listed projects (which may include airports) will get expedited federal review and permitting. Transportation Secretary Norman Mineta said, "This initiative is intended to make our transportation investments more efficient, helping to ease congestion and reduce pollution." He continued, "By working in close concert with governors and transportation leaders, we hope to identify effective procedures for routinely expediting consideration of environmentally sound transportation projects nationwide." The constitutionality of the order is questionable, as it runs counter to environmental protection laws. "Bush Orders Streamlined Transportation Project Reviews"
"Environmental Stewardship and Transportation Infrastructure Project Reviews." Mineta, a turn-coat Democrat, knows better. Road projects simply never "ease congestion and reduce pollution." He would have difficulty citing a single case where this had actually occurred. The US Congress passed a bill that would mandate fuel efficiency improvements for passenger trucks (usually known as "sport utility vehicles, light trucks, and minivans") built after 2006. Their average fuel economy would be improved by less than one mile per gallon (MPG). Environmentalists and some Democrats had sought tougher standards, particularly for SUVs, such as the rules adopted 30 years ago, which required a fleet-weighted fuel efficiency of at least 24 MPG. Subsequent Republican administrations gutted the rule. Predictably, US car manufacturers contend that higher mileage standards would force them to produce lighter vehicles that are less safe and more expensive. While heavier vehicles might be slightly safer for those riding in them, they are more dangerous for everyone else. "U.S. lawmakers agree to trim vehicle gasoline use"
And then. . . Bush vetoed even that. And now for something more encouraging. The French have done it again. Having given the world lightning-fast, comfortable TGV service, they turned their attention to the prosaic moving walkway, found in airports around the world and used in metro systems to facilitate connections between lines. While transiting Paris a few days ago, your editor rode on an under-test moving walkway that travels at 9 km/hr and has the potential to reach 18 km/hr. Users are gently accelerated to 9 km/hr while passing over a 10-meter length of interleaved rollers, with each subsequent roller turning slightly faster. Users must grasp a handrail, which accelerates in synch with the walkway, or risk losing their balance. At the end of the acceleration section, users move onto a conventional rubber belt, but this one moves about three times as fast as usual. The process is simply reversed at the far end. The pilot project is 185 meters long, but lengths up to 500 meters are believed feasible. The pilot program has not been without teething troubles. I saw two people fall, neither seriously. One was loaded with a heavy backpack and apparently failed to heed the instructions to grasp the handrail (possibly because he did not read French). I did not learn the cause of the other fall. I spoke to the project manager, who said that they still needed to find an effective way to teach people how to use the walkway the first time. It's much easier than learning to ride a bike, but it's still possible to fall if you don't understand what to do. Such walkways, especially if the 18 km/hr speed can actually be achieved, have the potential to significantly affect public transport and thus urban planning. Such high speeds would make it possible to dramatically enlarge the area served by a transit halt. Having enjoyed the moving walkway, your editor then rode the TGV Atlantique to the Spanish border. A trial program on that line asks passengers not to use their mobile phones in the seating areas, and to move to the vestibules to take or make calls. Not everyone was heeding the request, but there was much less blathering into phones than usual. Passenger comfort really does matter, and the SNCF clearly does understand that. Having created amazingly quiet and comfortable high-speed trains, they are now searching for further ways to improve the quality of service. We wish them every success. San Francisco now has about 469,000 cars, up nearly 15% in just six years. There is now so little space left in the city's 49-square miles that cars are inching up onto the sidewalks. 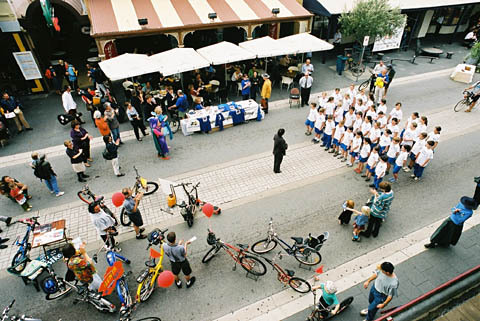 In response to this takeover of the city by cars, several groups organized the city's first carfree day, held on September 27. The people of San Francisco were invited to leave their cars at home and challenge themselves to be carfree for the day. A stretch of Montgomery Street, the Wall Street of the West, was closed from 10 AM to 2 PM. The Carfree Central Park campaign seeks to return New York's premier park to its original purpose: providing an oasis of peace in the center of a bustling city. The movement is making some headway. You can support the effort by signing the on-line petition. Suburban sprawl is associated with reduced replenishment of aquifers, increasing the risk of water shortages, according to a recent report analyzing the effects of pavement on runoff and groundwater recharge. The report estimates the extent of the problem in 18 fast-growing US cities. Increases in impervious surfaces can be traced quite directly to land consumption, so the authors studied the most land-consuming metropolitan areas, using data from the USDA's Natural Resources Inventory for the period 1982-1997. The report estimates that in Atlanta, the most rapidly sprawling metropolitan area in the USA, development over the past two decades sends an additional 57 billion to 133 billion gallons of polluted runoff into surface watercourses each year. This is water that would have otherwise have filtered through the soil to recharge aquifers. Stormwater runoff commonly carries high levels of toxic chemicals, sewage, fertilizer, and sediment, and stormwater events increase streambed erosion, pollution, and the frequency of flash floods. "City Sprawl Worsens Water Shortages"
Fremantle, in Western Australia, is an historic working port and with its attractive Cappuccino Strip and Fishing Boat Harbour, the number one tourist destination in the state. 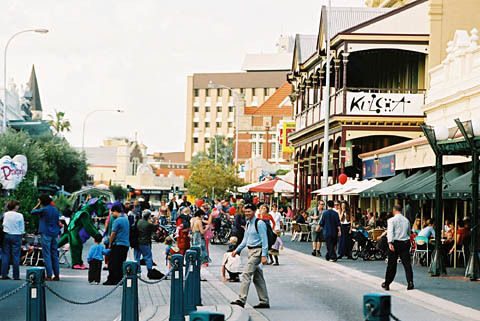 Although part of Perth's suburban sprawl, the City of Fremantle retains a unique identity. Support for the event has been strong. Shed Your Car Day is run with the enthusiastic assistance of an unpaid Community Advisory Group, and support from over 70 local businesses, the City of Fremantle, and the state and federal government. This year's event was Fremantle's third car free day. This year's event also received international support and recognition from the United Nations' Department of Economic and Social Affairs (DESA) as well as EcoPlan and the Commons. This collaboration allowed Shed Your Car Day to became part of DESA's Car Free Day Series, which promotes car free days as a transport planning and open-dialoguing tool that supports the goals of sustainable development. As a result, over 20 local government representatives from across Australia and New Zealand came to Fremantle to observe Shed Your Car Day and participate in a three-day seminar on sustainable transport. Western Australians have the highest rate of car use and car ownership in Australia; this cannot just be put down to the geographic size of the state, as the Northern Territory - another large state with remote towns and communities - has the lowest rate. The fact is that Western Australians are overwhelmingly car-dependent, yet most of the state's residents live in urban areas such as Perth. Perth, with a population of one million people, has more days of smog exceeding health limits than either Melbourne or Sydney. During Shed Your Car Day several blocks of one street are closed to vehicular traffic between 6.30 AM and 8 PM. The event has traditionally been held on a weekday, and a range of fun activities are held to demonstrate and enjoy the benefits of reduced car use. These include pavement art (cheap and popular: supply lots of chalk for kids - and adults - to draw all over the road), a puppet show in a parked bus, temporary gardens, skateboard and BMX bike demonstrations, sofas for people to lounge on, and community information stalls. One popular event is the cyclists' breakfast, which offers free vouchers for a muffin and coffee to cyclists. The event is run as a joint venture between the State Government's Cycle Instead program and a range of cafes on the Cappuccino Strip. Another popular event, aimed at commuters, is the Workplace Challenge. In its first year, workers from a variety of Fremantle organizations pledged to walk, ride, catch public transport, or carpool on Shed Your Car Day, thereby saving an estimated 2,900 vehicle kilometers and reducing CO2 emissions by 579 kilograms. Local schools have also been involved and are encouraged to promote the day to their school community. Many choose to organize a "walking bus" for children to walk to and from school on the day. Other school groups visit Fremantle's city center to enjoy the puppet show or to demonstrate their walking school bus by walking down the Café Strip in formation. This year, students from the alternative Lance Holt School monitored air quality in the closed section of road. The challenging and fun slow bike race has become a Shed Your Car Day feature. During this light-hearted event, the last rider across the finish line wins. Most contestants fall off in the first few meters! It has become a tradition that the day ends with a vibrant parade. Led by local community drumming troupe Freo Samba, the evening parade brings the day to a close with dancing in the streets. Since its inception, feedback about Shed Your Car Day (collected through intercept surveys) has been overwhelmingly positive. 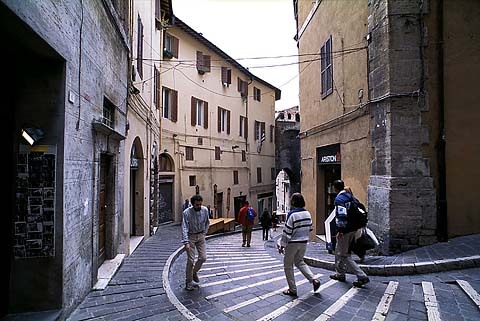 For example, many people enjoy how "quiet" and "fume-free" the Cappuccino Strip is on the day. Ironically, the "Strip" is normally busy with noisy, polluting car traffic, despite the fact that it is full of al fresco dining outside the many cafés. Of people surveyed in 2001, 96% thought the event was a good idea. Around 60% of the 300 people interviewed had heard about the day, with 27% of them leaving their cars at home as a direct result. Nearly 100% of respondents said they would like to see Shed Your Car Day repeated, with 29% saying the street closure should be a permanent feature. Public awareness of and response to Shed Your Car Day was no doubt influenced by the strong support it has received from local media. It also received good coverage through interviews and public service announcements in mainstream media across the metropolitan area. I write to congratulate not only the organizers of the practicum and of the car free day, but also the far-sighted local councils involved and the communities, which supported them. The event was not only a great success in highlighting the issues surrounding sustainable transport issues, but it also contributed greatly to my enjoyment of the delightful city of Fremantle. It is amazing how much more pleasant it was to visit the Cappuccino Strip without cars around during the car free day theme. Fremantle is a good example for my city to follow, and I have instructed the staff in my council to begin planning a similar event in Christchurch next year. Congratulations to all involved in the day including community groups and members, local businesses and your council. I hope similar efforts to promote and celebrate other transport choices such as walking, cycling, public transport or even carpooling will be taken up by other cities in Perth and elsewhere, to create better and healthier urban futures. In a world increasingly beset by transport related challenges it seems very likely that events like Shed Your Car Day that promote the goals and practices of sustainable transport will gain more and more currency. Information about and photographs of Shed Your Car Day can be found at www.uncfd.org and www.freonet.net.au/shed-your-car/. John Pinkard is the TravelSmart Officer for the City of Fremantle and the Town of East Fremantle. If these guys could decide, there would be no cars in central Stavanger. But they don't - not yet. Still, they are fronting a carfree festival one weekend this coming spring. Inspired by the carfree areas in cities like Freiburg, Lyon, and Venice, the environmental youth-activists in Stavanger, Norway, are determined to fight the growing pollution caused by private cars in downtown Stavanger. It's not the biggest city in Norway, but pollution is a growing problem in this, the oil capital of Northern Europe. "The idea actually came from the activities of 'Reclaim the Streets,' says Mimir Kristjansson," spokesman of the movement. Torstein T. Solberg, the youngest Labor candidate in the municipal elections next autumn, is even more enthusiastic in his characterization of the upcoming action. "We'll take control of the central part of our city - Vågen - and replace cars with concerts, dancing people, jugglers, and other happenings." "Let a hundred flowers bloom in the asphalt jungle," says Kristjansson laughing. Reclaiming the streets of central Stavanger is a controversial issue for downtown merchants. "We fear that business will hit the low notes if traffic is banned from the area," says one local dealer. That assumption is based on biases, says Solberg. "On the contrary, we believe that business will boom if cars are removed and pedestrians are allowed to move freely in the central parts of the city." Kristjansson characterizes the fear of the local traders as out of touch with reality and modern thoughts on city planning. "We know that other cities have blossomed by restricting cars from vital and central parts; it is nonsense to think that the evolution of a modern city depends upon the number of cars cruising the center," he adds. Nonsense or not, the young environmentalists are not alone in their attempts to stymie growing traffic and its destructive consequences for the environment. "Indeed, we have calculations that show that less car traffic in center of town will boost trade and make it more attractive to the locals and tourists alike," says Solberg. In a city that has been the center of the Norwegian oil adventure these last 30 years, environmental arguments have been scarce. Money, and employment, have been the words of the day. But now pollution and other environmental issues are taking over the agenda. "The last 10 years, the emissions of NOx-gasses have doubled five times and the situation is gradually starting to affect the lives of the citizens here," says Kristjansson. As a matter of fact, more than 400 students are affected by pollution from the intense car-traffic in the center of the city. "The noise from the traffic is also pestering and damaging the very lives of more than one million Norwegians," says Solberg. He stresses that Stavanger is not an exception in the Norwegian environmental situation, but rather the rule. "We have seen major floods in Europe and Asia this summer and we fear that this is a manmade catastrophe," says Kristjansson. "Norway, with all its riches and surplus from the oil-industry, is in fact one of the world's worst polluters in terms of NOx and COx-emissions." The young environmentalists have been busy organizing the carfree festival next spring. "Making alliances with all who want to secure the future for coming generations is an important task for us," says Solberg. "We don't want to rule out anybody, whether they have particular or general interests in reducing car traffic in the city center." Stavanger thus follows suit with other European cities in fighting pollution from the ever-increasing use of private cars. "We'll reclaim 'Vågen' between May 30th and June 1st," the youths say. With such self-confidence and enthusiasm, who is going to stop them? The author a journalist for a local newspaper, a former environmental activist, and member of the city council in Stavanger. You editor has been invited to attend and hopes to do so. Vote for any Democrat you can find in the November elections, even if they're people you don't like. Bush & Co. simply must be derailed in their efforts to destroy 30 years of hard work that has yielded moderate environmental gains. Virtually all Republicans have been bought and paid for by business interests. (Yes, it's probably all technically legal, but so what?) This is especially important following the untimely death of Sen. Paul Wellstone, one of the Senate's few remaining liberals. It's time to send Bush a message that even he can understand. The fate of the planet hangs in the balance. Throw the bums out. Diesel fuel is heavily subsidized in the EU - the pump price for this fuel is far below that for gasoline. Given the recent revelations about the very high dangers of diesel engines for human health, the EU should remove this price differential as quickly as circumstances permit. This will rapidly diminish the sale of diesel-powered cars, providing measurable relief from this risk within a few years. Any other course of action is irresponsible. There is, in any case, no reason to provide subsidies to any class of highway transport. "New design philosophies" come along with some frequency. It seems there’s always someone with a pet manifesto to trot out. It can be dizzying trying to keep up. It used to be, if you were a Modernist, you were safe from the vicissitudes of design trends. But then came Postmodernism, and a moment later Deconstructivism flared from literary theory onto the facades of buildings around the globe. Some design firms are still playing catch-up. Now, just when the trend-watchers among us figured Situationists were due for a full-blown come-back (see AdBusters magazine #37, September/October 2001), here comes Tony Fry of Australia’s EcoDesign Foundation, advising us to restart our engines yet again. Actually, he’d rather we shut them off. Fry would have us understand that what we commonly consider to be the major movements in (Western) design, from the Enlightenment on, actually represent a continuous evolution of the same spirit of atomization and autonomy that, ironically, has led to a globalized mass-mind unique in human history. "Mass consumerism, mass production, mass markets, mass media and the like all fuse with a technology of fetishisation (advertising), the generation of modern quantities of waste, and the unthinking, uncaring and myopic self-interest that is at the core of unsustainable lifestyles." 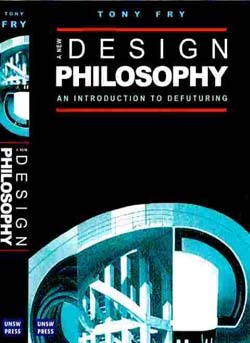 Fry’s proposal, "defuturing," suggests that designers step back and try to think another world into being: a world where "relationality" rules supreme, where "sustain-ability" is nurtured and where the "defutured" is brought from the concealment otherwise provided by capital-D "Design." The quotation marks give some idea of Fry’s task. As he says, the word is "the first object of design." His lexicon, therefore, is the first hurdle for the average reader, especially those not well versed in Heidegger or Derrida (Fry definitely means "philosophy" when he says "design philosophy"). Fry speaks of the necessity of "defamiliarizing the familiar. . . Communication is a process of labour rather than a correspondence of meaning. . . [This] text is based on giving the reader work to do. . . . [I]ts success will be measured by the extent to which it brings active readers into being." Is the book a success? Consider the evidence: it’s been two years since it was published, and an Internet search of "defuturing" yields a scant 51 entries, most of them linked to the EcoDesign Foundation itself. In other words, while Fry is capable of lively writing and engaging anecdote, his book is a textbook, not a popular guide. His "process of labour" is too laborious for most designers; too textual for such a visually-oriented profession. This visual orientation is something that Fry laments. "Signs of violence can be wrapped in attractive packages." He is also aware that most designers, even those who might be receptive to a book offering a way into "sustain-ability" (the ability to sustain), are too busy solving design problems to devote time to thinking about design philosophy. He cites this attitude as typical of the unthinking productivism that perpetuates unsustainability. However, Fry is not strictly pessimistic. He pins some hope on a shrugging off of anthropocentrism via a re-emergence of the "relationality" (correlative thinking) of the ancient Chinese, such as Lao Tzu and Confucius. He offers another glimmer of hope with his observation that the Greek word techne, the root of "technology," originally meant know-how: "that knowledge of the hand tutored by experience, and inscribed in memory of the making." Thus the Pragmatist philosopher John Dewey’s "learning by doing," which lies beneath the education of all architects today, holds hope for a different kind of knowledge than that which blindly guides assembly-line mass production. But first techne must revolt from the "order" of reason. How will that come to pass? It may be that one day enough students will have come out of Fry’s EcoDesign Foundation--which grants graduate degrees in "Sustainment Design" and teaches defuturing in its core curriculum--to bring defuturing into wider practice. It may even be, as Fry suggests in his discussion of the Bauhaus, that numbers need not be high. "The impact of the Bauhaus cannot be equated with its scale, material resources or narrativisation. Put alongside the size of contemporary institutions it seems like a dust mite in a mattress." But until then, defuturing per se is not destined for the mainstream design profession. Fry’s encyclopaedic knowledge of philosophy, ancient and modern, and his wide reading in popular culture, are evident in the excellent footnotes, bibliography and index provided with this book. I only wish its weakness as an object of design (flimsy paper, staid layout) could have been overcome. For if the beautiful can serve to conceal the defutured, so, surely, it can serve to display the means of sustain-ability to better effect. Just look again at that issue of AdBusters. Reviewed by Jacob Allderdice, M. Arch. The next issue of Carfree Times is scheduled for January 2003. Carfree Times is published on Carfree.com in odd-numbered months. To receive e-mail notices of new issues, please visit the subscription page or send e-mail with the word "Subscribe" in the subject line. We do not share our mailing list. E-mail announcements of each new issue are mailed to approximately 900 subscribers. This mailing list is not shared for any purpose. A rough estimate of first-year circulation for each new issue is 5000. Carfree.com as a whole serves over a million pages a year. The site now contains about 1500 pages.